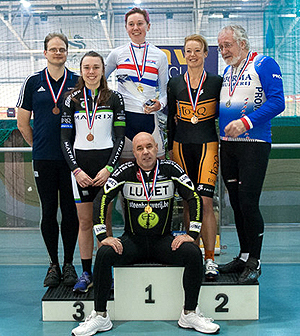 Katie Archibald and James Holland-Leader were crowned National Derny Champions in a thrilling finale to the 2013 season at the Wales National Velodrome, Newport on Dec. 29. Archibald added to her growing reputation with a commanding ride in the 15k women's race, paced to the front by Ian Smith and was never seriously challenged. 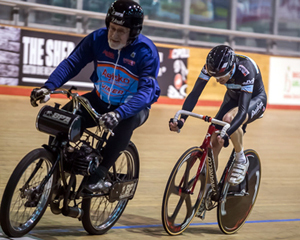 Behind Archibald there was a battle-royale for second place between defending champion Hannah Walker, paced by George Gilbert, and multi-world masters champion Janet Birkmyre with Graham Bristow. In the closing stages, Walker could not find the legs to come around Birkmyre, who rode clear for a superb and deserved second place. Behind them, Niki Dukes-Kovacs in her first race at this level, mixed it early on with the big guns in the 60-lapper and rode to a fine fourth place with Tony Hibbert. Archibald's winning time of 16 minutes 42 seconds reflected her stellar form at the moment and she joins an illustrious group of former winners, who include fellow GB team pursuit stars Laura Trott and Dani King, as well as Victoria Pendleton. King, who raced in the supporting programme, was on hand to present the trophy to Archibald, named in honour of John Dennis, who died earlier this year, but did so much to promote derny racing in the UK. 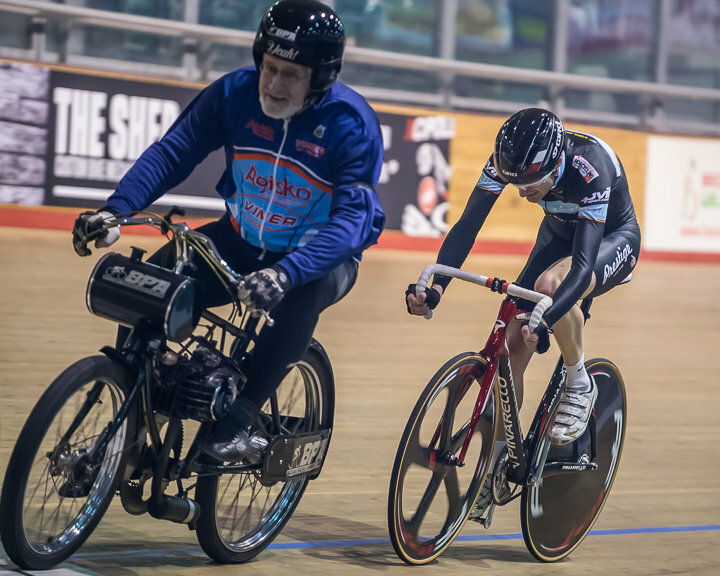 The men's race, for the Ron Pugsley trophy, developed into a three-way battle between Holland-Leader (Prestige VC), Symon Lewis and Phil Trodden, who had made the long journey south from Scotland with pacer Davie Urquhart. Lewis (Nuun Sigma Sport London) spent much of the 120 laps at the front with pacer Gilbert with Holland-Leader and Graham Bristow tracking them and Trodden in close attendance. With a dozen laps to go, Holland-Leader made his move, coming around Lewis and surging clear. Trodden could also not respond. He crossed the line a lap up to claim the title for the first time with Lewis and Trodden making up the rest of the podium. 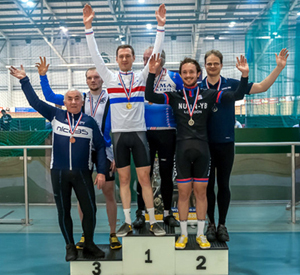 Oliver Hitchings combined with Simon Layfield to finish best of the rest in a fast race in indoor conditions at Newport, the winning time 31 minutes 36 seconds. The event, promoted by Tricyclesports.co.uk, also featured a string of top class supporting races with King and Jon Mould (Team USN) stretching their legs to good effect ahead of the 2014 season. 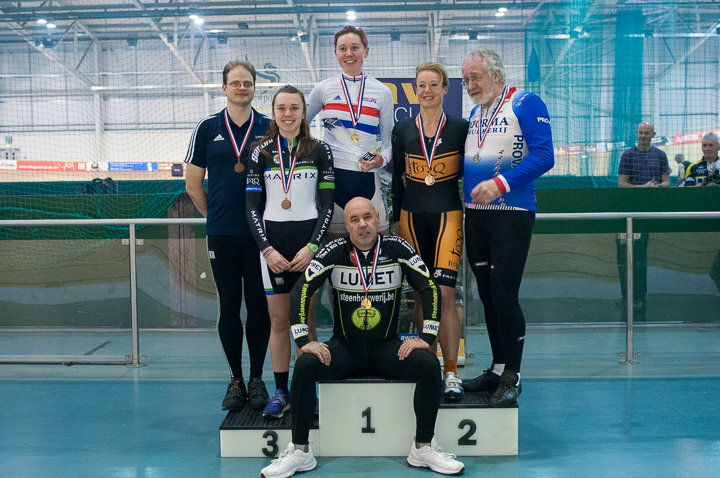 King won the women's scratch and points races, but had to give second best to Archibald in the Keirin final, the Scot showing remarkable powers of recovery after her derny effort and also mixing it with the men in the open points race. Mould won both men's scratch races, but was pushed all the way by youngster Tristan Robbins (BH-Solidor-Wamyouth) in the 20-lapper. Robbins won the opening scratch in his group and his points race. 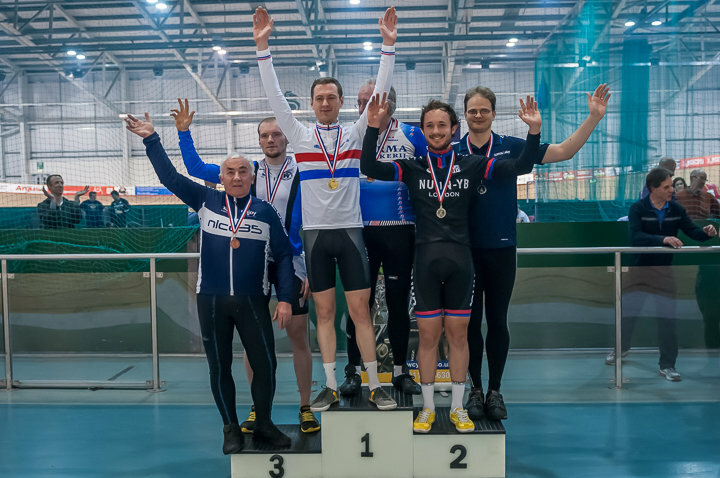 Mould was denied a hat-trick in the men's keirin final, with the judges awarding the verdict to Max Nethell (County Cycles Racing) in a very tight finish. Walker rounded off the evening by edging out Abbie Dentus in the final event, a 12-lap scratch.